Several years ago, as a freshman in college, I picked up an old (for back then)400MHz Thinkpad. It became the victim of all manner of hacks. The keyboard was modified to something non-qwerty, which completely broke vim keys and had me exploring other editors. The hard drive was replaced with a 2GB compact flash card. This was before you could buy real laptop CF-IDE adapters. 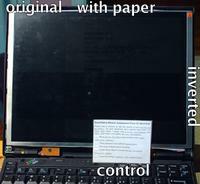 It was for industrial computers, and while there was a laptop IDE connector, the form factor did not match a laptop drive. A single afternoon with the dremel made it fit, but to this day it needs a wedge jammed under the drive to keep the connector from coming loose. This laptop is going to be used for another experiment. I had twisted it into a slow but lightweight flash based laptop years ago, and now we have netbooks. Maybe I can get another jump on the industry by making a sunlight usable laptop. Right now, the state of the art for sunlight use is the transflective screen. Surprisingly, no one is offering transflective screens. There are two netbooks coming out in India, but while the screen is awesome, the rest of the laptop is weak. 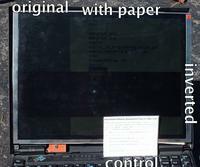 There are numerous expensive and heavy ruggedized laptops with transflective screens, but those are expensive and heavy. On a whim, I gave ultraportables a glance. There is exactly one new model with a transflective screen. The Portege R600 is available with OpenSolaris for $1500. The lack of windows is extremely awesome, as the version with windows costs five hundred dollars more, same specs. Quite possibly the most egregious windows tax I have ever seen. I won't buy the Portege. It is good to know the option exists. But it is tempting. Especially that transflective screen. Most PDAs use transflective screens, and they are good. The common complaint of weak color was valid 10 years ago but no longer. My thoughts go back to the old Thinkpad. I could make an ambient transmissive display. 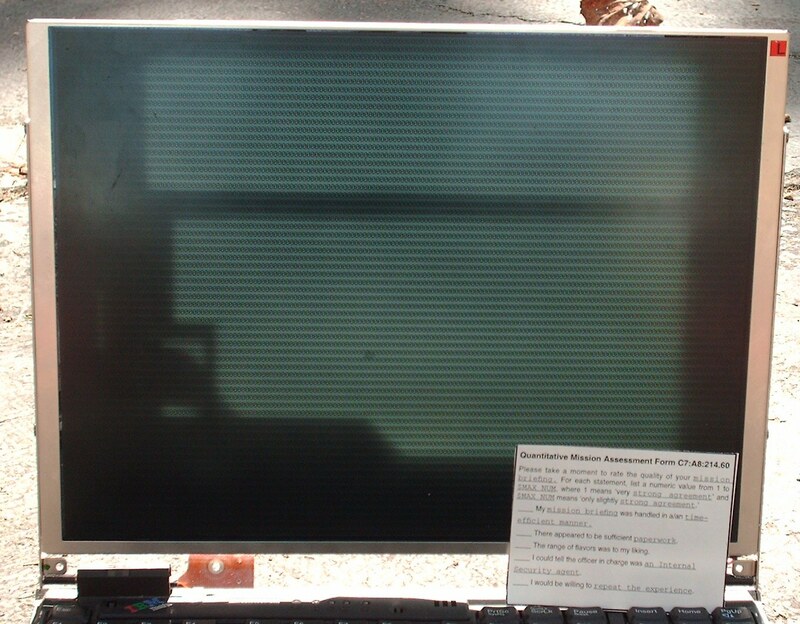 Remove the backlight, chop a hole in the laptop lid, allow the screen to be lit by the ambient light from behind. I've seen it done once before. The results were nothing short of spectacular. The Thinkpad is not without problems. Suspend-to-ram breaks the display. The laptop is heavy, weighing just a tad over 2 Kg even with the cdrom and internal cards removed. The traditional rubberized paint is peeling. On second thought, let's hack it with abandon. Replacements from ebay are not that hard to find. I've already flipped the keyboard back to Qwerty and cleared out a bunch of unused applications. The LCD was easy to remove. A few screws and plastic snaps removed the bezel. Popped out the inverter, which only lowered power consumption by 10%. 7.0 watts to 6.3 watts, so just an extra half hour added to battery life. However, outdoor use usually requires a cranked up backlight, which raises power to 8.7 watts. For this specific situation, the power savings are significant. Using the CLI instead of X saves 0.6 watts (less wakeups). Black text on a white background saves another 0.3 watts (less active pixels). It all adds up. The LCD itself is going to be an adventure. It consists of several fragile layers, all held together by a metal frame. By cutting some tape and loosening the edge clips, I could start to pull the layers apart. I am worried about breaking the fragile connectors to the glass itself, but I could pull the frame apart just enough to drop a sheet of paper behind the glass, in front of the diffuser. Indoors, a large font is required. Outdoor closeup. Drop shadows are everywhere. In these pictures, you are looking at a terminal directory list. The right two thirds is covered by paper. 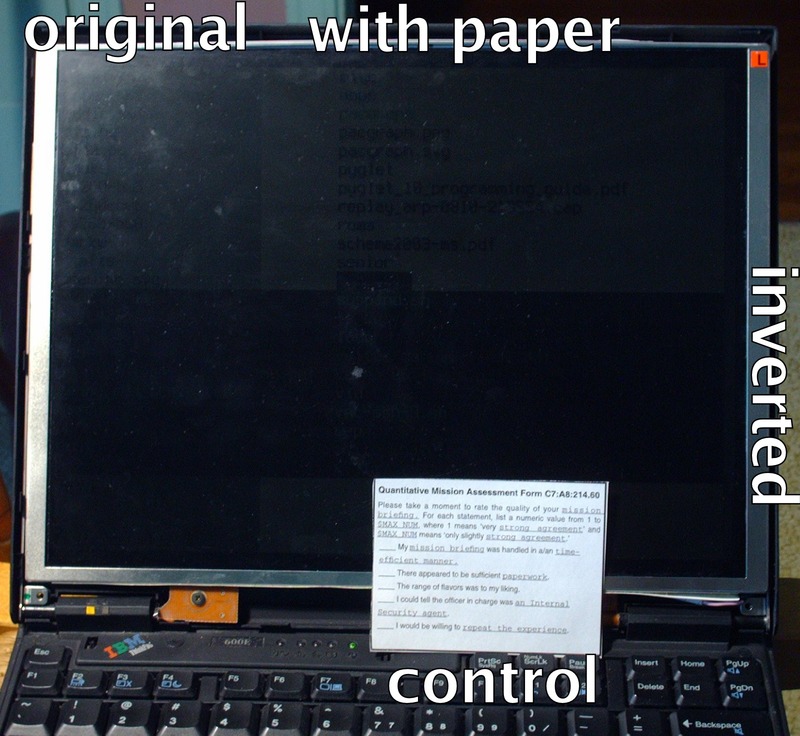 The unmodified diffuser makes a low bound, and the printed card is a control. Some text was inverted to show how unreadable W-on-B is. Generally, you have to use black text on a while background, and be very strongly lit. Indoors, it was just barely legible under a desk lamp. 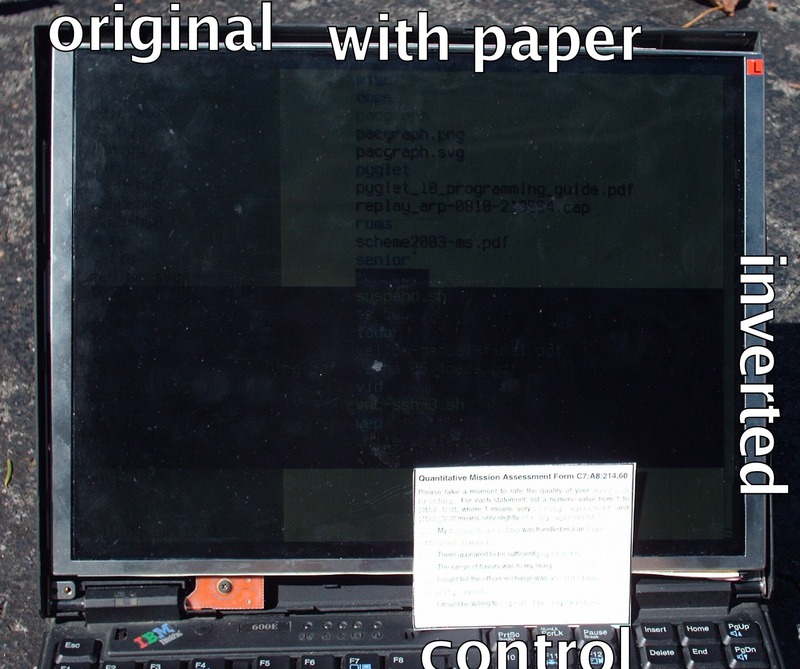 Outdoors was much better, though in direct sunlight the laptop gets warm very fast. Black on white is necessary because every dark pixel casts a shadow. A black background means no light gets through to illuminate the white text. Images need to have their gamma cranked way up. Any theme needs to be pastel colored. Using the brightest whitest paper helps a little. Overall, this is a simple but barely useful modification. If you look at the shadow picture, you can see the real problem with using a transmissive display in a reflective manner. Basically, each white pixel casts three colored subpixel shadows, which are not in alignment with the actual pixels. A red shadow bouncing up through a green subpixel is going to look pretty dark, even if the intended color is white. Reflective LCDs do not cast internal shadows. If the paper reflector was vertically closer to the subpixels, alignment would be better. Unfortunately, that would require taking apart the glass, which looks to be impossible. Taking apart the diffuser is nerve wracking, but I think I am getting the hang of it. The big concern is to preserve the flat cables which wrap around the frame. Internally, behind the glass is two translucent sheets of plastic and two Fresnel prisms. Behind this is a tapered piece of plexiglass, two sheets of opaque material and the support frame. Finally, a pair of circuit boards. So far I've tried a dozen different diffusers in place of the stock setup. The perfect diffuser would take a single small bright point of light from the backside, and evenly spread the illumination on the front side. In essence, shadows would make the whole screen slightly dimmer, instead of blacking out one portion. The display is full of zeros. Circuits and framework on the backside cast obscuring shadows. This is really hard. The best combination so far is two pieces of thin paper sandwiching a layer of plexiglass. This does a pretty good job of bouncing the light under shadowed areas. And there are a log of shadowed areas. The plastic support frame, circuit boards and LCD cable all cash shadows. Floating a single (tabbed/screened) terminal in the bright portion almost works. The perfect diffuser is going to be a bit of a quest. Using two sheets of paper is really inefficient, most of the light is reflected instead of passing through. Something lens based would improve the efficiency. So I am looking for a thin sheet with a lot of very small concave depressions. Sheets with convex bumps are commonly used to focus light onto low end solar cells, but this calls for concave lenses to spread the light out. The lens layer is placed over a sheet of plexi, and this is placed over translucent material. Weaker/cheaper lenses means the plexiglass must be thicker, but substantial aberrations in powerful lenses are perfectly tolerable. Simulations show it throws a lot of light to the sides. I've finally found a good candidate for a diffuser. You can get small glass spheres of various sizes from lab supply stores. Being lab equipment, they are outrageously expensive. But 2D simulations seem fairly promising. Nothing can be done about the opaque circuit boards, but the support frame is going to get a lot of holes drilled to let in more light.